Are you searching for the latest news? Here you will find all our press releases, news and pictures. Are you a journalist? Contact us if you want to book an interview, have questions about Printed Circuits, or the entire purchasing process. A stack-up of hats and PCB - we are ready to meet! Electronica 2018 - just days away! Good result in Q3 for Elmatica the demand for PCB is steadily increasing. Meet us at Tec Lund for a PCB chat! Meet us at Tec Lund - table nr. 62 the place to be! Early involvement of PCB broker in the product development process, gives added value and saving time and money, says product owner Altlight. 3 anniversaries - 140 years of experience! Last week three of our Senior Technical Advisors celebrated their long service at the company and the total of 140 years of experience! No need to worry - we are open all summer! We take care of your purchasing process, so you can enjoy a great summer! The Final Draft for Industry Review of IPC-6012DA with Amendment 1, is available for review and comment. Tec Warsaw - Let´s meet up! New language solving communication challenges in PCB fabrication. Meet us at this years Evertiq EXPO Helsinki, April 19th. Elmatica with a new corporate movie with a twist! What happens at IPC APEX Expo? Read it at the blog. Chair of IPC 6012-DA talks about the factors addressed when revising the addendum. KwickFit, an enterprise-grade cloud-based PCB Array, and Panel layout optimizer are first out to implement CircuitData into their solution. Since the Chinese New Year is a nationwide celebration, it will affect production. Increase in business and focus on compliance leads to adjustments in the Customer Service department, for Printed Circuit Broker Elmatica. Terho Koivisto former Aspocomp Manager, is appointed as Country Manager in Finland for Elmatica. Read our CEO, Didrik Bechs experiences from the Defence and Security Equipment International (DSEI) in London last week. Two new Certified IPC Specialists at Elmatica last week. Printed Circuit Broker Elmatica informs about the risks and implications of failing to comply with U.S. defence export and import regulations. We keep business running all summer! It might look like we are all in vacation mood, but we keep the business open all summer! Give us a call! 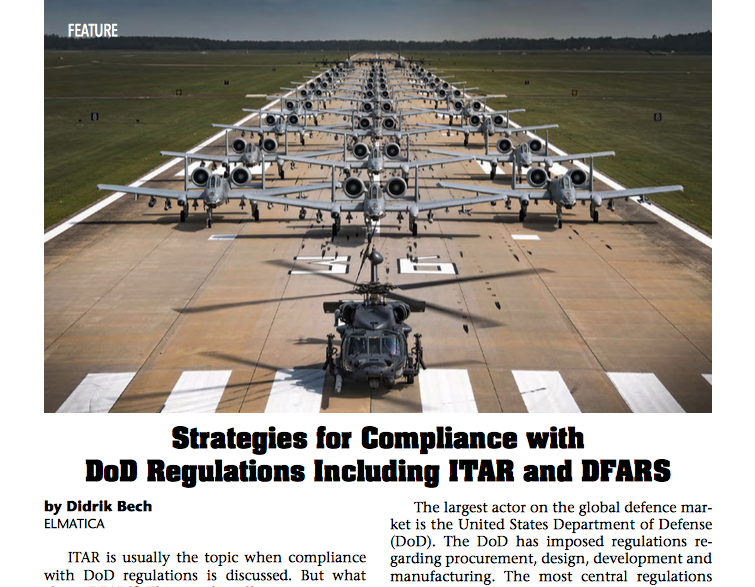 CEO of Elmatica, Didrik Bech share strategies around Compliance with DoD Regulations Including ITAR and DFARS in the July edition of the PCB Magazine. Are you as compliant as you think you are? Printed Circuit Broker Elmatica encourage the development of a new language in PCB fabrication. Join the group and have a saying. Elmatica and Slovakian Organisation for Space Activities cooperate on new Space Electronics event. More business lead to further employment at Elmatica. Why always talk about ITAR when we should talk more about DFARS? Several reasons to explain the increase of Flex and Rigid-Flex. Over 25 years experience in the defence industry, enables Elmatica as the optimal partner at the Trade Compliance Nordic in Copenhagen. Aiming for a global standard in the medical sector - members still wanted! Aiming for global standard in medical sector - members wanted! Sign up to our newsletter, and you will be the first to get enlightened within the PCB development.